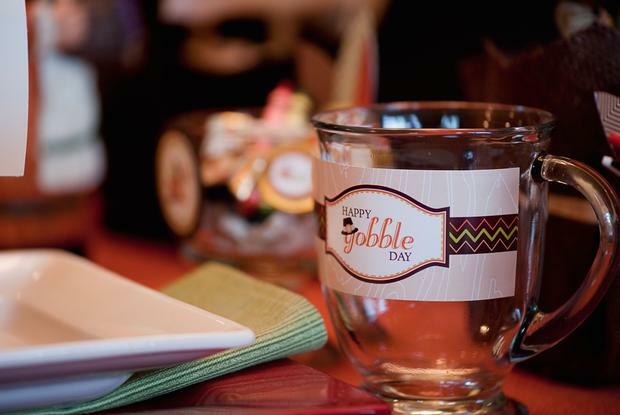 No complaints will be arising from the kids’ table this Thanksgiving! 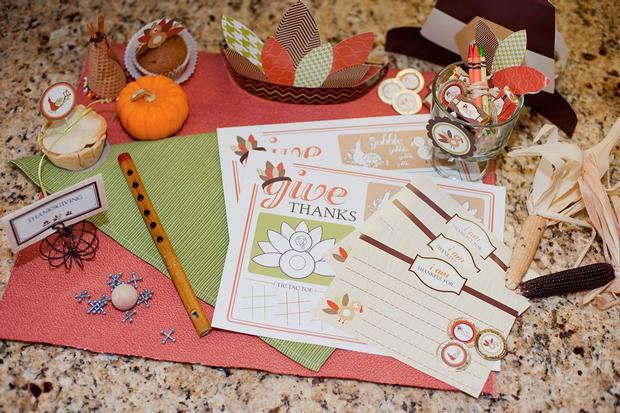 Jen Carver of Banner Events here AND I’M sharing some kid-friendly Thanksgiving party ideas my friend, Vivian Kerr, and I created. 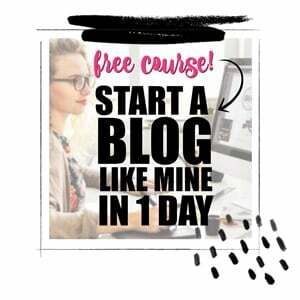 When you are mothers of 4 children each, you are continually searching for fun and festive ideas for involving the kids in holiday preparations and traditions. 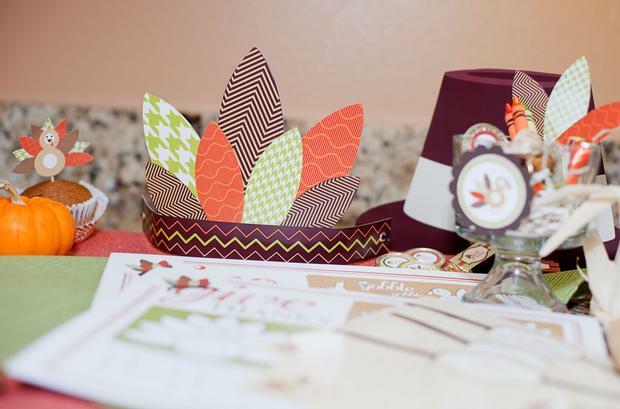 We fell in love with Anders Ruff’s Happy Gobble Day printable collection, purposely created with kids in mind. 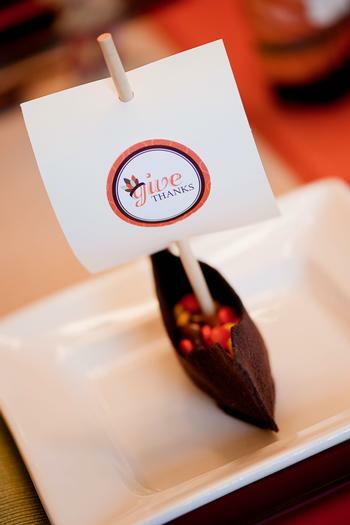 It was the perfect springboard for designing Thanksgiving party decorations, treats, activities and favors our kids would love! Enjoy the magic of our Thanksgiving party captured by Andrea Pasion Photography. This fall acorn pudding is a great recipe for kids! 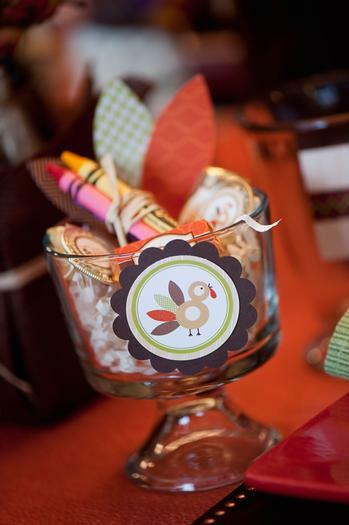 Entertain the kids at your Thanksgiving feast with one of these 12 Thanksgiving craft ideas for kids. 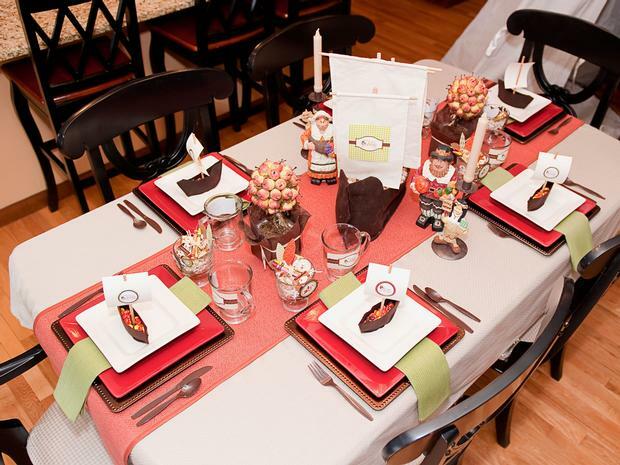 When approaching the styling for this Thanksgiving party, we were determined to create an interactive experience for our kids at the dinner table as well as away from it (realistically, how long do your kids actually stay in their seat during Thanksgivingdinner?!). 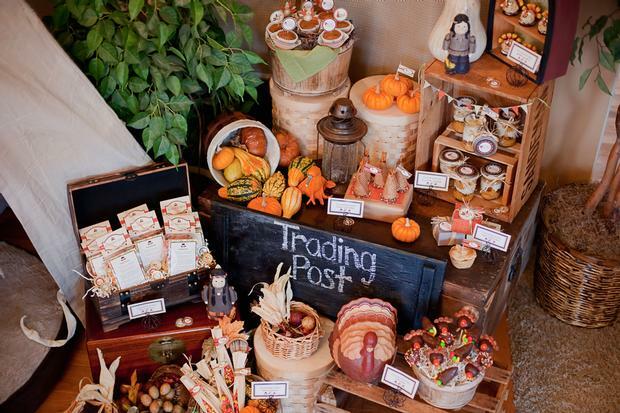 We designed a festive kid-centered tablescape and came up with a creative idea to have a trading post, in lieu of the traditional dessert table. To help teach our children about Pilgrims and Indians and have them experience trading, we create “Gobble Day” gold which they could trade in for after dinner treats. We had so much fun creating the trading post. Neutral herringbone fabric was hung to create a backdrop. Artificial plants and trees were arranged to help create the illusion of being out-of-doors. 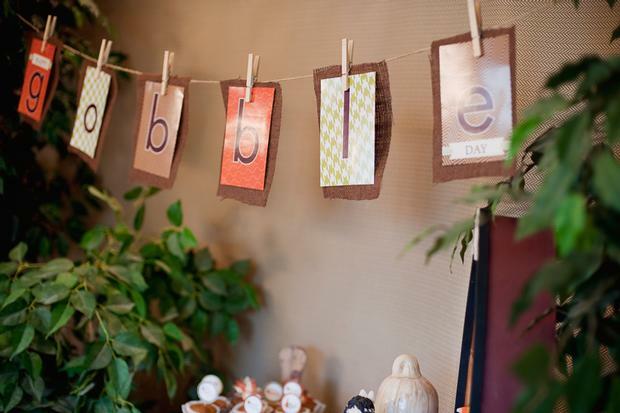 A “Happy Gobble Day” banner was hung from burlap squares attached to clothes pins, hung from twine tied between two trees. A life-sized teepee conceptualized and constructed by Vivian was the focal point of the trading post. 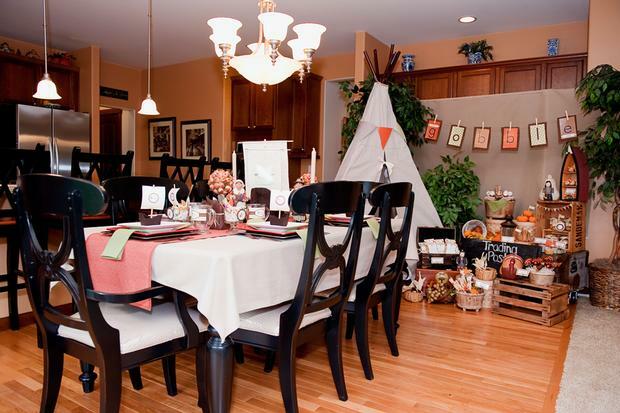 Made from sewing together canvas paint drop cloths and PVC pipe painted brown to look like wooden sticks, it was a well-loved addition to our kid-friendly Thanksgiving party space. To add color and interest to the top of the teepee, we created a triangle bunting using coordinating printable pattern papers from the Anders Ruff’s collection. Not only was the teepee the designated spot for trading, but it served as a popular play place for our little guests. We created “Gobble Day” gold easily by adhering the colorful Thanksgiving party circles to plastic gold coins. Each child received a few at their place setting and had the opportunity to earn additional gold coins through good behavior. To bring in a rustic feel, we collected old chests, crates, baskets, wooden boxes and a cornucopia which we over-filled with pumpkins, Indian corn and gourds. We added a few pieces of more modern décor to fill in spots. All of these items helped to serve as our display for trading post treats. Our guests had fun choosing from an assortment of delicious treats. 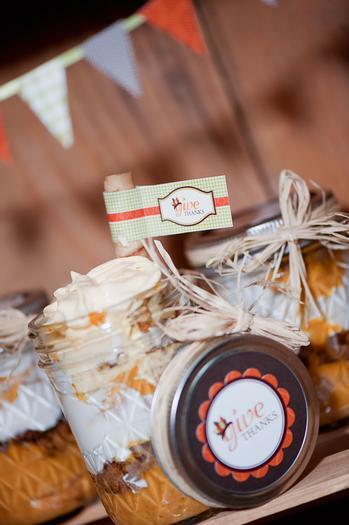 There were pumpkin parfaits in small canning jars consisting of layers of pumpkin mousse, whipping cream and crushed gingersnaps. Raffia and printable labels accessorized each parfait. 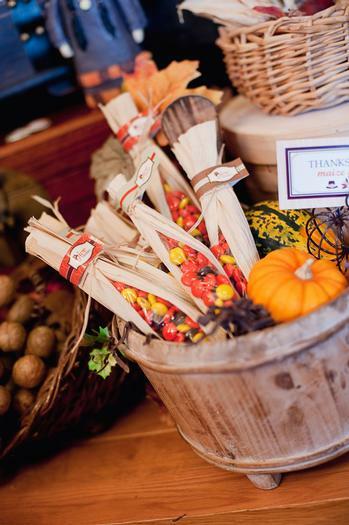 Faux Indian corn favors were a favorite. Fashioned from dried corn husks with small bags of Reese’s Pieces candy tucked inside, each maize favor was tied off with tiny pieces of raffia. These looked awesome displayed in a harvest basket. 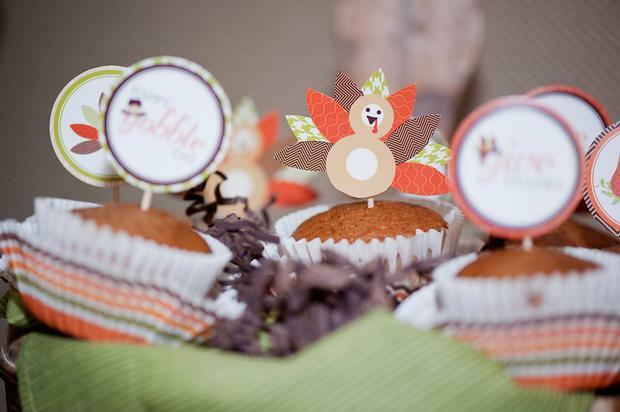 Pumpkin muffins clothed in colorful striped liners were topped with darling printable turkeys on toothpicks. 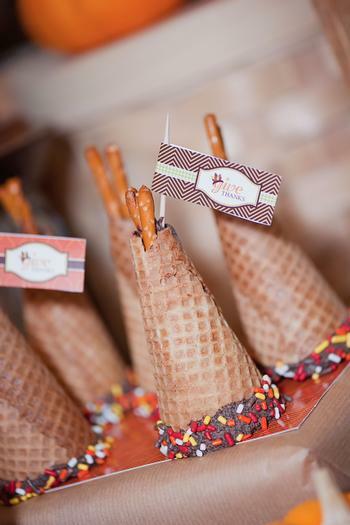 Teepee treats were made from sugar cones, dipped in chocolate and rolled in colorful sprinkles. A few broken pretzel pieces were added to the teepee top to look like sticks. 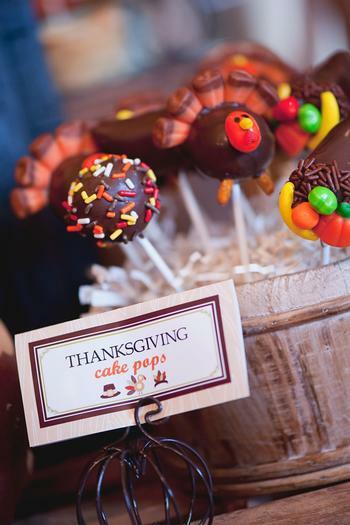 Johanna Dellino of Pop.O.Licious Cake Pops created turkey and cornucopia cake pops, which were kid favorites. And because anything mini is adorable, Vivian baked up mini apple pies using premade pie dough baked in muffin tins. 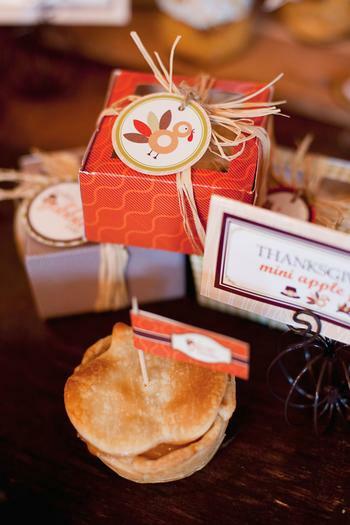 Coordinating digital paper was used to make mini pie boxes. 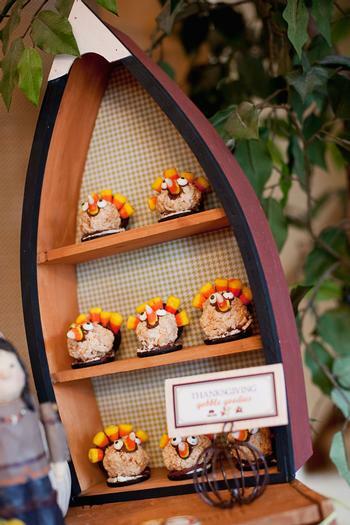 Because traditions are always fun to incorporate into parties, Vivian included one of her family’s favorite treats—“gobble goodies”. These adorable turkeys were created by rolling Rice Krispy treats into small balls and attaching them to one half of an Oreo for the body with frosting. Candy corn feathers are attached to the base of another Oreo half. Edible candy eyes and a candy corn beak complete the face. 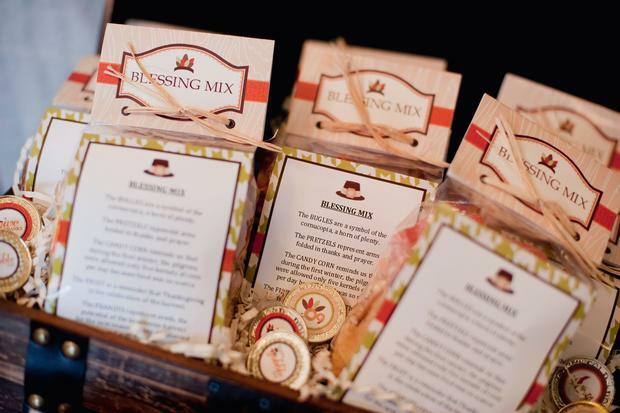 Packages of “blessing mix” were created as a guest take home favor. These were an easy assembly item and included cellophane bags filled with a mix of peanuts, pretzels, Bugles, candy corn and candy orange slices. Each item represented part of the “blessing mix” poem, which was attached to the front of the bag. Designed for kid-friendly fun, our Thanksgiving table has lots of simple touches to keep kids busy while parents are busy finishing up the Thanksgiving meal. We used adorable coloring and activity placemats from the Anders Ruff collection and “I am Thankful” cards, both of which provided activities to keep the children busy. Each child’s place setting included a small crayon bundle displayed in a mini glass trifle dish decorated to look like a turkey. A few pieces of “Gobble Gold” and mini chocolate bars were also included. Clear glass mugs were dressed up in adorable beverage labels. Mini Mayflower ships were made from felt. Party circles were attached to the sails to tie our theme together. We added a hand-sewn Mayflower to the center of our table as a focal point and displayed wooden Pilgrims and Indians. Hand sewn napkins and a table runner were made in coordinating party colors. Because children love dressing the part, we created feather headbands and pilgrim hats from the printable collection. We added some costumes purchased at after-Halloween sales. Vivian sewed beautiful dresses and bonnets for the girls. The children had so much fun learning about traditional toys and games and practicing trades in the teepee. 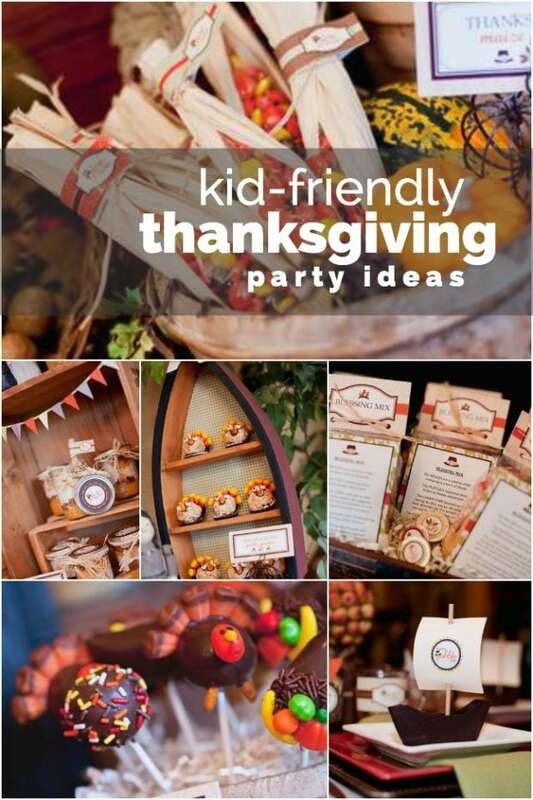 We hope you have fun planning your own kid-friendly Thanksgiving party and can use our ideas to inspire your own! 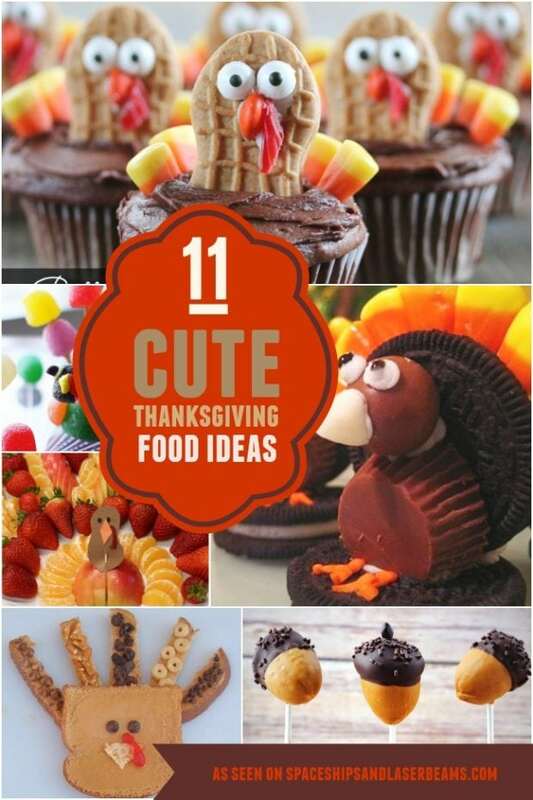 Be sure to check out some more kid-friendly Thanksgiving ideas.